The Spot Remover Pro Model utilizes a molded in spring that allows you to screw on your bait that holds your worm securely for many repeated casts and catches. It is molded with their trademark flat head design that enables your worm to stand on end giving it a more enticing look. The hook is a 90 degree Mustad Ultrapoint hook. It is available in 1/8, 3/16, ¼ , 5/16 and colors Black and Green Pumpkin. The second version is The OriginalSpot Remover Jig, it has a molded in notched keeper that hold your worm securely without having to screw it into place. Many anglers prefer this version because they feel it does not tear up the soft plastic when a fish is hooked. It also features the flat head design as well as the 90 degree Mustad Ultrapoint hook. It is available in 1/8, 3/16, ¼ and colors Black and Green Pumpkin. I love fishing shakey heads and have tried every brand of heads on the market. This is the head I now use exclusively, I love the fact that the flat head design allows my worm to stand straight up when the bait is setting on the bottom. I prefer the Pro Model with the spring, ¼ ounce green pumpkin head. I feel it allows me catch more fish on a single worm because it holds it in place next to the head during hook sets and when fighting a fish. The ¼ ounce allows me to fish deeper water and gives me a better feel of the bottom. The hooks are razor sharp right out of the package and the paint holds up extremely well even when fishing around rocks. I usually use a 7” Strike King Super Finesse worm on these heads and 12lb McCoy Fluorocarbon line on a 6’6” bait casting rod. These heads outperform their competition such as Gambler Giggy Head and Lucky Strike Finesse Football Heads by utilizing the flat head allowing your bait to stand up instead of laying flat on the bottom. This little gem is just a souped up version of the Spot Remover Pro Model. It has all the same features but with a rubber skirt already added giving the bait more bulk and action. It has the same spring keeper and flat head and when teamed with a 7” finesse worm, it ROCKS!!!! If you are looking for a lure to catch schooling fish, look no further!! Tandem willow blades spin and vibrate, attracting hard-striking action. Equipped with Sampo swivels, needle point hooks and chip resistant paint. All you have to add is your favorite soft plastic fluke, grub or shad. It is available in ¼, 3/8,1/2,3/4 in Pearl, Chartreuse, Albino and Ark Shiner colors. I like to fish this lure on a 6’6” baitcasting rod with 12lb McCoy Fluorocarbon line. Cast it out and reel with a medium speed retrieve pausing every few seconds allowing the bait to fall and the blades to twirl and flutter. This is one of my “go to” baits in the Fall when the shad have moved to the back of the bays and the bass are gorging before Winter. 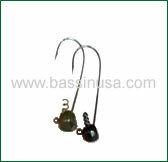 This bait out performs its competition such as Gambler Meano and the Fish Head Spin Swarming Hornet due to its tandem willow blades versus their single. It has more flash and vibration allowing the fish to zero in and crush it!! Welcome to Knuckle Down Lures. The finest hand crafted bass fishing jigs, spinnerbaits and buzzbaits, made right here in the USA. Our lures are made from the highest quality components featuring Mustad® UltraPoint® hooks. Tournament proven right here in the Midwest – Knuckle Down baits get bit when the others won’t. Next time you are out on the lake whether for fun or competition – Knuckle Down! Freedom’s Live Action Hybrid Jig’s and Spinnerbait’s enhance the action of any favourite plastic or swimbait giving them a life like appeal that fish have never seen before. Freedom Tackle Corp. is committed to providing anglers with cutting edge technology. We strive to improve the accuracy and efficency of anglers without restricting their freedom to customize. Think of our products as tools that enhance the systems you already fish with. We pride ourselves in each and every product we produce, which is why every product we sell is unique to the industry and truly one of kind.